Unless you’ve been living under a rock the past few weeks, then you know that Samsung suffered a devastating loss against Apple in a landmark copyright infringement case. But it doesn’t mean Samsung’s ready to give up the fight. In fact, it looks like Samsung is now on the offensive and is trying to get back at Apple any way they can. 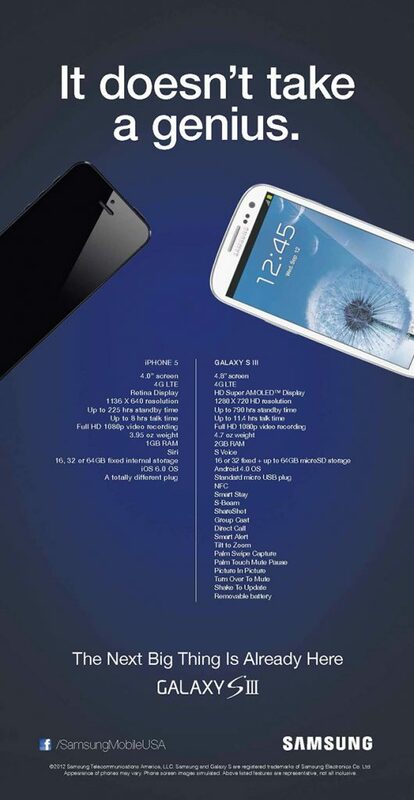 First shared by Mashable, the ad lists down the features of the iPhone 5 and the Samsung Galaxy SIII side by side. Presented this way, Samsung’s intention to show how the Galaxy SIII easily trumps the iPhone 5 in key categories such as screen size, talk time, RAM, and expandable memory is clearly evident. But even without reading the details, it’s already apparent that the Galaxy SIII has a longer list of features than the iPhone 5. There’s also no missing that tongue-in-cheek jab delivered via the clever “It doesn’t take a genius” tagline of the ad. Apple fanboys were quick to defend the iPhone 5 and have responded with parodies of the Samsung ad. One of the more clever ones replaces the tagline with “Don’t settle for cheap plastic” and lists down iPhone 5 features that Samsung has no doubt deliberately left out. Will Apple take the bait and issue an official response defending the iPhone 5? We’ll have to wait and see.